What’s the connection between wine, poetry, Gone with the Wind, and soccer? In a couple of previous posts, on George Meredith and Sir Edward Bulwer-Lytton, we’ve endeavoured to find five interesting things about two of Victorian literature’s neglected figures. Now it’s the turn of Ernest Dowson – decadent poet. Some of these are particularly surprising. 2. He is responsible for several book and film titles, notably Gone with the Wind. Margaret Mitchell took the title of her vast American novel from another of Dowson’s poems, which (again!) sports a long Latin title borrowed from Horace, ‘Non sum qualis eram bonae sub regno Cynarae’, or ‘I am not as I was in the reign of good Cynara’ (commonly known, for perhaps obvious reasons, as ‘the Cynara poem’). The phrase ‘gone with the wind’ appears in this poem and Mitchell ‘borrowed’ it for her novel, having rejected working titles for her book including Pansy and Ba! Ba! Black Sheep. Dowson also gave Michael Moorcock the titles for two of the volumes of his Dancers at the End of Time series of science fiction novels, The Hollow Lands and The End of All Songs. Oh, and apparently the name Cynara means ‘artichoke’ in Greek. 3. He is the first person (on record) to have referred to ‘soccer’. Though he spelled it differently, as ‘socca’, in a letter of 1889, it’s clear enough that Dowson is referring to the game of football. This may strike us as surprising, since the image of Dowson we have is of a dandy and aesthete, a sensitive poet and decadent; but when we look at the context of the word’s first recorded use, it makes more sense: ‘I absolutely decline to see socca’ matches’. 4. He translated Les Liaisons Dangereuses into English. This classic eighteenth-century epistolary novel by Pierre Choderlos de Laclos, better known to English readers as Dangerous Liaisons, was translated by Dowson in the 1890s, and shows the range of his talents – not only was he a gifted poet but also a talented translator. (Dowson also translated the poetry of Verlaine into English.) The scandalous nature of this novel may have appealed to Dowson (who harboured an affection for an eleven-year-old girl named Adelaide ‘Missie’ Foltinowicz, who was possibly the inspiration for his Cynara poem). Dowson died of alcoholism, aged 32, at a friend’s house in 1900 (not in a wine bar, as is sometimes claimed), his untimely demise perhaps accelerated by his heavy drinking after Missie married a tailor in 1897 (Dowson appears to have been crushed by the marriage). 5. He inspired the Cole Porter song ‘Always True to You in My Fashion’ from the musical Kiss Me, Kate. In the lyrics to this song, and the song’s title, Porter alludes to the refrain from Dowson’s Cynara poem, where each stanza ends with the declaration, ‘I have been faithful to thee, Cynara! in my fashion’. According to his fellow decadent poet and friend, Arthur Symons, Dowson’s favourite line of poetry was Edgar Allan Poe’s ‘The viol, the violet and the vine’. But we’ll leave you with perhaps Dowson’s most celebrated non-poetic line, on the influence of that decadent drink of drinks: ‘Absinthe makes the tart grow fonder.’ Quite. Image: from The Poems of Ernest Dowson © 1905, public domain. It is sad to read of someone so talented dying so young. Thank you for this post! I agree. Poor old Dowson… Left behind some wonderful little poems though, amongst the other legacies. Thanks for the reblog! Herein are five good reasons to reblog this post from Interesting Literature. I really like this series, IL … you always seem to dredge up something riveting about someone I have not heard of … Meredith aside. And there is nothing I like more than someone decadent who dies tragically young … again, Meredith aside. Can you find some more please? Your wish is my command, Angela – any requests? I’ve got another forgotten Victorian lined up for the series, but always welcome new suggestions! I know, it was only when I started researching for this post that I uncovered that – I was as surprised as you! That was fascinating. Thank you. I’m going to look into his poetry. As always, fascinating. Thank you for another great post. Thanks, Ellen! I really appreciate it. As always, fascinating stuff. A great post, take a bow. Pretty sure knowing Ernest let me pass my oral PhD entrance exam with flying colors.The professor looked surprised! Really? Haha, that is interesting! I suppose he’s one of those figures – not a household name, but those who know of him often really value him. Cynara (how I refer to it) is a pretty devastating poem. An interesting post on one of my favourite poets. “They Are Not Long” is beautiful in it’s simplicity. Besides being a poet Dowson also wrote a number of short stories and one play. The latter concerns a moon goddess and her trist with a mortal at Versailles. Dowson should be far better known than he is. Ernest Dowson achieved a lot in his short life. Gone with the wind was a great phrase to come up with. As an Englishman I must confess to not being a fan of the term soccer. I agree about ‘soccer’ – interesting to know that he was the first (known) person to use it not long after it was coined (from ‘Association Football’, I think the story goes?). Quite nice that the honour should go to a decadent poet! Very interesting, Mr IL. I’m a big fan of ‘the Cynara poem’. So was Richard Burton, apparently – there’s a Burton reading of the poem available on Youtube. I can imagine how he would relate to it. Thanks for the heads-up on this; I’m going to have a listen to that later. Yes, I can imagine it struck a chord with Burton! We should also remember Dowson for being one of the few people to show compassion for Oscar Wilde in exile. I recommend Penguin’s “Decadent Poetry from Wilde to Naidu” to anyone who’d like an introduction to Dowson and his peers. I love that book’s brief biography of Dowson, which says that he died from tuberculosis, alcoholism “and various bad life choices”! I would like to go and read some Dowson poetry now. Thanks for the insight. Another great post. I’d not heard of Dowson but will look him up now. I shall look out for Dowson in future. I first heard lines from Dowson (They are not long…) at the end of the film Laura. Were these lines used in the novel the film was based on, or just for the film? That’s something worth finding out. Hi. In case you are not aware I’ve nominated you for the Versatile Blogger award for your very interesting blog. Reblogged this on THE BLACKBOARD OF LASCANA. Why is it that all of these famous old poets die so young? It’s like being depressed and slightly suicidal was a prerequisite for their genius. I love love love the Cynara poem especially since I have a recording of Richard Burton reading the poem! Dowson has long been one of my favourite poets and I recently read his two published novels (written in collaboration with Arthur C Moore), which I found to be surprisingly good – ‘A Comedy of Masks’ particularly so – given the unflattering critical consensus. Great to see the post reminding us of a few reasons why he should be better remembered, although I’ve never thought of him as a “dandy” – unless you can be a shabby dandy! I first heard of Dowson when his lines from “Cynara” were quoted in Donald Spoto’s biography of Alfred Hitchcock, THE DARK SIDE OF GENIUS. They were used in the chapter discussing VERTIGO. I wish I could remember which lines they were. 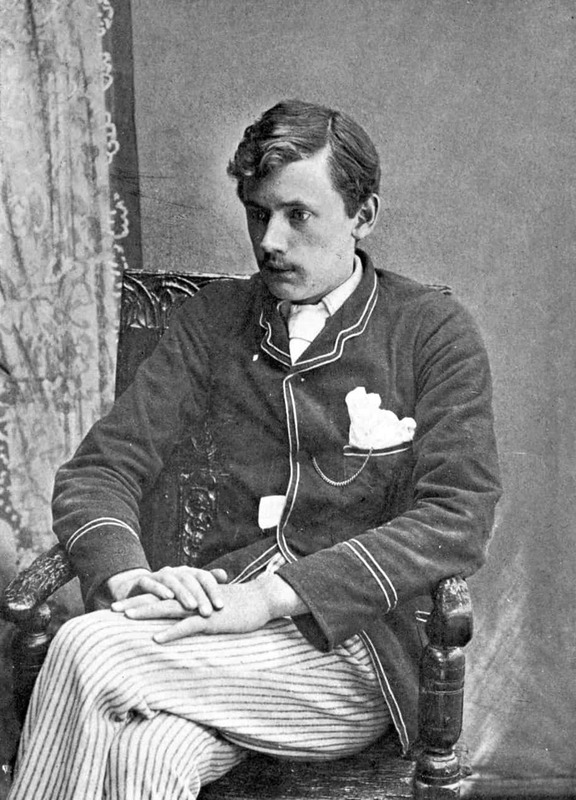 Ernest Dowson popped up so many times during my Wilde studies that I could not help but fall in love with him. And who wouldn’t? He is the whole package: tragedy, beauty, youth, death, and decadence. He even throws absinthe in the mix! Wilde loved him; that pathos that enveloped Dowson singles him out as the epitome of poetry itself. One interesting thing I found was that Robert Sherard was who ultimately rescued Dowson during his last days of life until the latter died in Feb 1900. However, Sherard does basically the same thing with Wilde, who died in November of that same year. Wilde died alone, however, in Dieppe. I just find it interesting that Oscar and Ernest basically died slowly together. Poetry can break or make you. Many years ago, I remember watching a black and white Hollywood movie (maybe from the 1940s). The main character was an arrogant, self-important (and rather skinny) presenter of a popular culture show on the radio. Towards the end of the film (shortly before he is killed, if I remember correctly) he recites Dowson’s “Brief Life”. It was such a stunning performance that it has stuck with me all those years, but I can’t for the life of me remember the movie’s title or the actor’s name. Anybody any idea what I’m talking about? Just looked it up, and in this American Playhouse version, they quote the wine and roses poem at 1:45 and mention a Dowson book on the bookshelf at 1:48. EDMUND: It’s a good likeness of Jamie, don’t you think, hunted by himself and whiskey, hiding in a Broadway hotel room with some fat tart — he likes them fat — reciting Dowson’s Cynara to her. …But who am I to feel superior? I’ve done the same damned thing. And it’s no more crazy than Dowson himself, inspired by an absinthe hangover, writing it to a dumb barmaid, who thought he was a poor crazy souse, and gave him the gate to marry a waiter! [He laughs — then soberly, with genuine sympathy] Poor Dowson. Booze and consumption got him.